Lokon is a very active twin volcano with the adjacent Empung and is located close to the pleasantly cool town of Tomohon, which is surrounded by agricultural land. 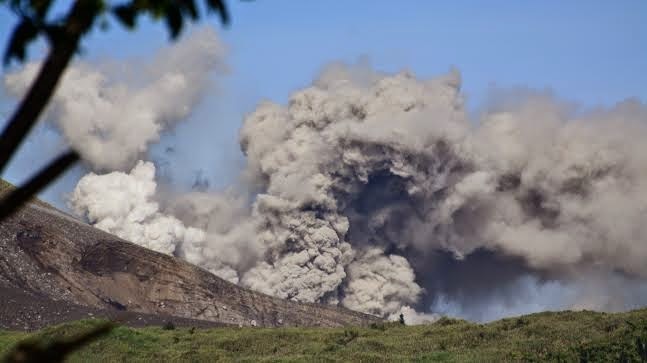 All recent eruptions have originated from the Tompaluan crater which lies in the saddle between the two peaks – when most people say they climbed Lokon they mean they visited the crater and most guides will think you only want to go to the crater. If you are flying in or out of Manado airport in clear weather you are in with a chance of an excellent view of Lokon, Tompaluan crater and the old Empung crater from above. There is actually a Volcanological Centre in Tomohon where you can find out information about the activity of volcanoes in the area and obtain an English speaking guide – several guides have quite good knowledge about the history and geology of the area. However, all the guesthouses and hotels can usually provide a guide too. A good thing about the hike to Lokon is that it starts from wherever you chose to stay in Tomohon (the town is at around 800m above sea level). You begin by wandering along pleasant country lanes with good views of Lokon, before you have to pass by a small stone quarry and start the climb up to the crater. An early morning hike is the best way to have a good chance of panoramic views so – if possible – set out no later than 5am. The route is along a (usually) dry river bed that is actually an old lava flow; this can be quite slippery because it is so smooth. From the stone quarry it takes just 60-90 minutes to reach the crater rim (1,130m). The overgrown Empung lies to the right and has a deep, vegetated crater well worth inspecting on its own right. On the left is the true summit of Lokon (1,580m). Most people actually stop at the crater and rarely go to the summit, for a very good reason. The steep slopes of the dome shaped Lokon mountain quickly become dominated by 8 ft tall grasses that are razor-sharp. You really need to wear some gardening gloves and long trousers. If possible, you should also bring a machete to hack away the worst of the grasses that will be encroaching on the narrow path. The true summit on the relatively flat top is hard to find because of the grasses, but a trail is identifiable that winds through to a high point crowned with a tall cement trig pillar (probably of Dutch origin). Warning: there is another overgrown mini-crater near the summit of Lokon, avoid this area and skirt around it to the left to reach the summit area. There is also a very deep hole right next to the summit pillar itself. Great views of Tomohon, the crater, Gunung Klabat and the Bunaken islands (including the steep, extinct volcano cone of Manado Tua) can be achieved part of the way up the slopes of Lokon, but even better is the panorama if you stand on top of the summit pillar itself. From the atop the pillar you can see smoking Soputan volcano in clear weather conditions and sometimes the islands further north of Manado including Tagulandang. From the crater rim to the Lokon summit pillar takes another 60-90 minutes, so in total you can be up at the summit in about 3 hours or so from the centre of Tomohon. Bear in mind that many guides will not want to trek to the summit especially if the wind is blowing gas from the crater in the direction of the summit. Access to the crater itself is also determined by the level of activity and given the number of victims over the years (including most recently in 2017) this is something to take very seriously indeed. Return the same way you came and allow about 2 hours from the summit to Tomohon. 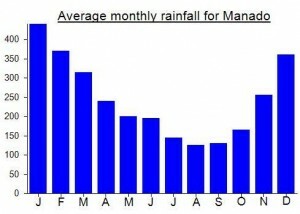 Bagging information provided by Andy Dean, updated by Dan Quinn (July 2017). Getting there: Plenty of public transport from Manado to Tomohon. Expect to pay around Rp10,000 for the hour-long 25km bus journey. Taxis are around Rp140,000 and Gojeks under Rp50,000. From the centre of Tomohon, head along the road past the Lokon Mega Mendung Hotel for about 1 mile to the quarry. Accommodation: There are numerous hotels/losmen in Tomohon. thank you mr dan for the information about me. yes i dont care what hotel you like stay and i alwasy ready to guide you in this volcano or lokon volcano. i can guide to summit point of lokon volcano. my guiding time to summit is start on 00400 early inthe morning. if you stay in manado i will pick up at 0300 oclock. early in the morning. if you stay in in tomohon i pick up you at 004 00 oclock. the wether and visibility in the morning always the best and very good to climb the summit point. regard from guide jotje lala. Things didn’t get off to a great start in Tomohon this time but it is quite an entertaining tale that ends happily. I struggled to find someone in Tomohon who was up for guiding, despite the shortness of the hike and the closeness to town. I gave my phone number out at several cafes and asked at the homestay where I was staying. Finally, after a lot of effort, I found someone who agreed to pick me up the following morning at 5am. Alas, I got very little sleep at the homestay as a couple who live there were arguing at 3am, so I got up at 4am, asked for my undried washing back and told them I wouldn’t be returning for a second night. Recommendation: pay an extra 100,000 a night at a proper hotel not to have to deal with this kind of thing. I left the homestay and texted my guide for the morning to say I would meet him on the main road instead. No reply. Phoned him twice – no answer. Sadly in Christian areas it seems to be much harder to find someone keen on waking up at 4.30am to guide you up a volcano. Muslims, on the other hand, are normally already awake and ready to start the day. Anyway, I continued to wander into the centre of Tomohon and then off down the lanes to the right towards Lokon itself, hoping to find a guide enroute and also somewhere to leave my bag of undried washing! There were a lot of dogs roaming around at this hour – not pleasant, especially given the small chance of meeting a rabid one. Perhaps they could do with eating a few more at the local market! Alas, the only chap I found up for guiding said he would not take me to the summit but only to the crater so I decided, what with having had very little sleep and carrying a bag of wet washing, to cancel plans on a morning which had started badly and so far failed to improve. So, utterly fed up, I got a bus down to Manado and checked into the Ibis hotel – something quite unusual for me and a fair bit more than I would normally spend. It was money well spent though and the next day after a decent night’s sleep I started to make plans to return and give Lokon another try before the end of my holiday. So I got in touch with legendary local Tomohon guide Jotje Lala, who has been guiding on the volcanoes since 1986. Realy, I should have simply called him in the first place. We met the next morning before 5am (I got a Gojek up from Manado to Tomohon for about Rp48,000) and had good luck with the weather. Brilliant views up at the summit – the trig pillar is very similar to the one on Klabat, if memory serves correctly. I got a couple of minor cuts from the sharp grass at the top but it was a price worth paying for finally bagging Lokon after having been preveted twice due to high activity (this is often the case both for Lokon and Soputan). A great way to turn the bad start round and finish my holiday off on a high note. Thanks, Jotje Lala, for your help. Next time we shall hopefully do Dua Saudara…. On my flight back at 6am the following day to Jakarta, the views of Empung, Tompaluan and Lokon from the flight were brilliant – but I was on the wrong side of the plane to take photos. Ask for an A seat if you are flying west from Manado and expect conditions to be favourable (and send your photos in for inclusion on this site!) PS Photos of Empung crater also welcomed…. I guided 2 climber from swisszerland. mr benyamin and mr bastian. On the night i heard news one local guide lost on the crater.and team sar,police,and milter and local people climbed lokon and they found him inside the crater. Use legal guide with lisenced guide. This only my information for you. Need information i can give information via. If you like go to summit of lokon volcano you must do trekking very is the best to do.and you must fell where the wind blowing and if wind blow from the west and and the gas from the mouth of leading to to the summit.you not do it. You can also climb the top of lokon volcano . I was guide one family and acouple from swisszerland on 20 agust 2016 . Family vos from holand And elise and her boy friend from swiss .first i could family gained the summit of lokon volcano. 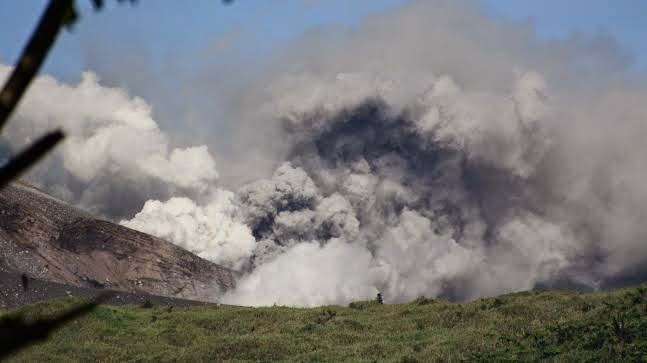 I was mr aaron brown to lokon active on 10 march 2016 we have the volcano very active and crater was bubling and boiling so we made photos very quickly and move down and next day the banner warning from goverment as warning . i amguidejotje lala.i am specialguide for lokon volcano.before my contactpoint in happy flower homestay.but now i am in wailan inn is located in my village called wailan.http://wailaninn.blogspot.com. lokon volcano still alert volcano so if you like to climb this you must know what you like to do.this is not only mountain but this is reguler eruption volcano one in the world. i am guide jotje lala.i want tell you that i am not full time any in happy flower home stay.but i dont care where place[resort] you are staying but if you need me as guide for lokon i am ready but you must volcanist tel you that lokon volcano is reguler eruption volcano. 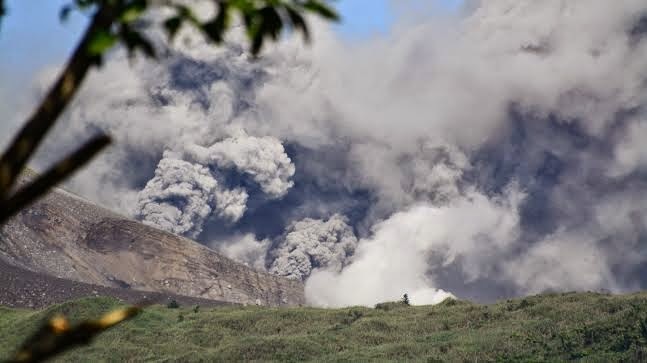 lokon in this month from 9,10 and 12,13 september 2013eruption july 2013 3 times big eruption. lokon volcano still very active untill now you can see the erption in this my info news.http://lokonvolcanoeruptionnews.blogspot.com.regrd from guide jotje lala. I was picked up from my hotel in Manado and we arrived at the trail head in 2 hr. It’s an easy walk up the old lava channel with occasional detours into the forest to the left. Remember to look back as you will have expansive views of Tomohon and the surrounding mountains of Soputan and Mahawu, which Dan describes above. To my surprise my guide, Jotje, tells me during the hike that he won’t take me to the crater or the summit since the volcano is active and it’s dangerous. That was disappointing as I was expecting a summit climb that morning. He stopped about 300 m from the crater and pointed it out to me. I continued ahead without him. There was steam but no explosions or anything that might be considered hazardous. Climbing to the summit on my own was then out of the question at that point. If you, the reader, will contact Jotje to climb Lokon or the neighboring peaks, make sure you establish right at the start that you wish to approach the crater and/or reach the summit. He seems to be very knowledgeable of the area but be sure to define your goals at the onset. iwant tel you after i guide you to lokon volcano eruption many times. 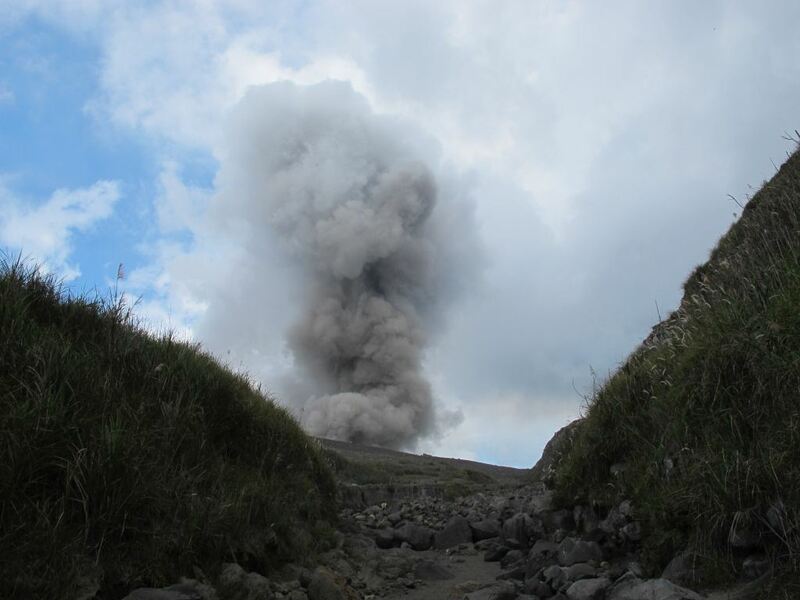 and the last in tnthis eruption 8 january 2013,24-25 december 2012 erupted,1-2 january 2013 erupted. regard from guide jotje lala. i am guide jotje lala. i inform you that lokon volcano eruption again on 12 january 2013. and another 3 times eruption on 16 january 2013.firts eruption around 11 oclok in the morning with rain and second eruted 5 ocklock afternoon and the third eruption around 8 45 in the night with glowing lava so this my information. I was out in Tomohon at the weekend. Alas, both Lokon and Soputan remain closed for the time being due to volcanic activity. Nevertheless I Managed to get a few decent photos of considerable amounts of smoke rising from Lokon and also made the very easy, short trip to the neighbouring Mahawu crater which is on the other side of Tomohon, just 15 minutes by motorbike from the angkot terminal and then a five minute walk to the summit where there is a cement marker. They were building a big hut at the top and the sharp grass swhich appears to cover every hilltop in Minahasa prevented me from wishing to make a circuit of the crater though it could certainly be done if you had a little machete with you. While you are in the area you may wish to check out Tomohon market, famous for its bats and dogs and snakes which most locals love to devour. Easier to look at through a camera than with your actual eyes, especially the dogs which have been blowtorched. The snakes look like pythons to me, and are apparently brought in from neighbouring Gorontalo province where there are plenty. I stayed at Onong’s Palace, a reasonably-priced place in Kinilow about 5km before Tomohon town – an idyllic setting and nice restaurant area where you can chat and have a look at books and see over the valley towards Lokon. Pictures of the legendary Guide Jotje Lala seem to adorn the walls of every losmen in the Minahasa region. He looks rather like a singer in some photographs and I look forward to meeting him in February for Lokon and Soputan (and Ambang) if volcanic activity has dipped sufficiently for the trails to be reopened. 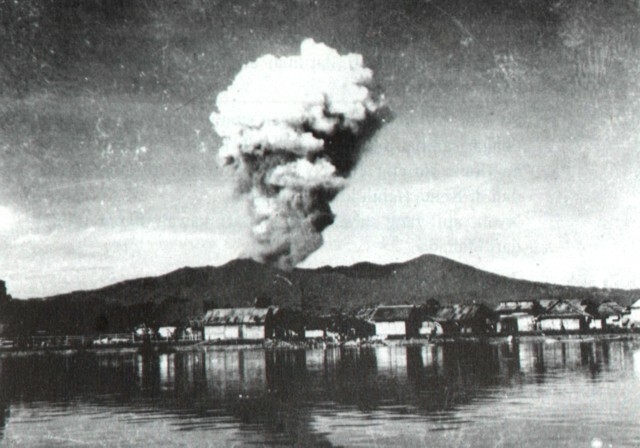 you can sea information about lokon volcano eruptioa in http://happyflowerhomestay.blogspot.com. Shame it isn’t more detailed. As a great fan of Blencathra (also known more boringly as Saddleback), it’s lovely to see the two gunungs mentioned in the same page title, even if there’s very little in the blog itself about the beautiful mountain that is Blencathra. A fine sight on the main road from the M6 at Penrith to the lakeland town of Keswick, one route up the 868m high mountain goes via the notorious Sharp Edge ridge, a great scrambling route above a small tarn (lake) that has an air of Macbeth about it in misty conditions. You can almost hear the witches calling out ‘fair is foul and foul is fair’ around their cauldron. If you’re ever in the area, you must stop off at the Old Crown pub in nearby Hesket Newmarket for a pint of locally-brewed Blencathra Best bitter. Ah, sweet memories! Lokon’s getting rather active again…. i visited Tomohon Manado at North Sulawesi 2 years ago with 2 friends and a friend’s kid. We were at an Island called as Bunaken island where we did snorkeling, whales watching and island hopping before we proceed to Tomohon. Tomohon was located at a hill and it took sometimes for our truck to reached our Home stay, Happy Flower Home stay. we could felt the coolness on the way up . upon our arrival at the home stay, we were mesmerized by the flora surrounded the home stay and the cool breeze was so refreshing. it’s more or less like our Malaysia kampung except the weather was cooler. we were introduced to the local guide, Jotje whom was a very eager to introduce the Tomohon to us . we started our 1st Volcano trekking the next day, and before we reached the bottom of the volcano, Jotje brought us to local market where we could saw lot of surprises whereby marketer slaughtered dogs on the spot for selling . we were brought to a cave later where Jotje said it was a hideout of the Japanese during the world war. the Japanese soldiers hide their weapon in the slim tunnels. i could felt the eeriness when i step into the dark and deep tunnel. Jotje brought us to a lake which was formed after the volcano eruption thousand years ago. the lake was huge and i couldn’t imagine how big the impact was the eruption to the local . we trekked up to the mountain and the trekked was more or less like a normal mountain trekking except we would had to step our foot on the sides of the channel form by lava as it was very slippery. it took us an hour to go up to the Lokon peak. we lingered at a huge and chilling waterfall for awhile on our way down the mountain. we trekked the second volcan, Gunung Mahawu the third day. The water at the volcano was crystal green and we could see there were lots of smokes coming out from the water surface. Jotje said volcanoes had 4 categories which were ranged from level one to four. I asked him why there were still had people wanted to stay there though they know the volcanoes will erupt anytime, as per him the people would know when the eruption and they will flee to the opposite sides where the lava won’t hit them. 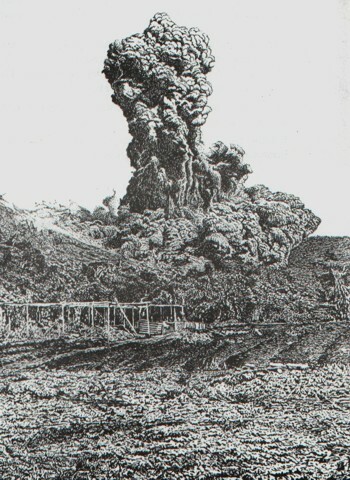 He also said the lava from the eruption was a source of living for them as the lava was great fertilizer to the soil. He was right, we could see lots of vegetables were plant along the terrain and most of them were big sizes. Jotje also mentioned that there was a god to in charge of a volcano. I couldn’t imagine how it was when there was eruption but I just think there were people whom did survive by making the most from the worst that nature had given. Two years ago, in the summer of 2009 I climbed Lokon with a couple of friends. We were staying in the Happy Flower Homestay at the foot of Lokon and it is over there that we got te idea to climb the mountain. This very friendly guide (named Jotje Lala) was at the homestay and he wanted to take us for a walk up the volcano. So, the next day we got up early in the morning (5am) so that we would reach the top before temperatures would start to rise too much. It was a very pleasant easy going hike. Before reaching the dry lava river bed you pass a little christian cemetery. Take a pause and enjoy the iconic pictures on the graves (you can also do this on the way down). When we actually got to the dried out lava river bed, the first step was the hardest. We had to climb up on 3 meters steep wall. But after that you can enjoy an easy-going hike up on Lokon. You can easily do this hike on your own when you don’t want to hire a guide. But if you want a fun companion, who does everything within his powers to speak the best English he can (and even Dutch). And you like to support the local guides. Then I suggest you contact Jotje Lala (http://happyflowerhomestay.blogspot.com) or one of the other local guides. We set out to bag Lokon the day before we planned to climb Gunung Klabat, thinking is was going to be an easy warm-up hike. Lokon is a very popular hike and getting to the crater is easy. We took a guide from our guesthouse – basically the gardener. Walking up the old lava flow channel is quite cool and it does not take more than 2 hours for a fit person to get to the dry and barren crater area. 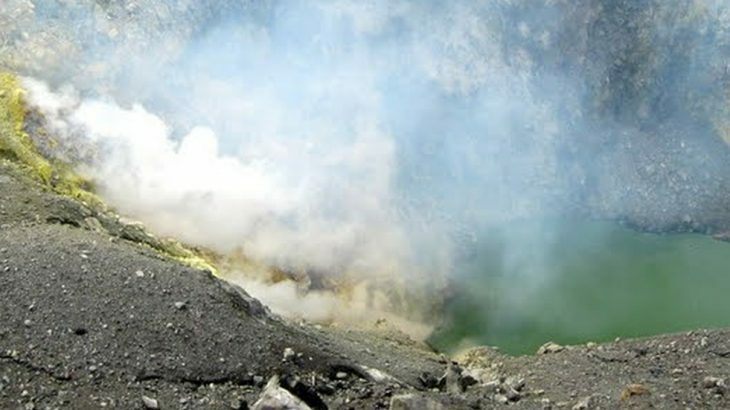 The crater is small but very deep with a small lake at the bottom, and is constantly puffing clouds of sulphurous smoke. The sulphur can be quite gagging if the wind changes direction – signs that the activity has recently increased are the dead trees surrounding the crater. Our guide (the gardener) and other guides told us the summit was not accessible, but speaking some Indonesian we explained that “we wanted to stand on the highest point, that he could wait for us at the crater.” Intrigued that we were mad enough to try to climb to through the razor sharp grass to reach the summit (and having never climbed to the highest point), he came with us wearing only shorts and a t-shirt. Luckily he had a small knife to cut away some of the grass. We ended up covered in scratches and cuts, but once we started we had to carry on. In the end, we weren’t entirely sure we had made the summit! Descending is pretty fast because the flattened grass is quite slippy and you slide down. We got back to Tomohon having experienced a warm up for Klabat that was a little harder than we thought.